En este caso, al primer método al que debemos recurrir es al Patrón Thread Pool. Este patrón consiste en limitar el número de hilos que hay ejecutándose en un momento dado. Si tenemos un hilo en background que está haciendo un uso muy intensivo del procesador, pero no nos importa ralentizar su ejecución, podemos hacer uso del comando sleep (Thread.sleep(...)) para que el hilo libere periódicamente el procesador, permitiendo que el resto de hilos puedan ejecutarse más rápidamente. Esto es útil para hilos que se ejecutan en modo mantenimiento, que deben estar siempre ejecutándose pero que no tienen por qué responder en tiempo real. Otra forma de parar temporalmente un hilo mientras otro se ejecuta, es mediante el método join (thread.join()), que hace que un hilo espere hasta que el otro hilo termine. Aunque más útil en caso de que tengamos un hilo claramente más prioritario que otro, no es viable si no podemos tener una referencia al hilo más prioritario desde el menos prioritario para indicarle a qué hilo tiene que esperar. Pero la alta concurrencia no viene dada sólo por el uso del procesador. Puede ocurrir que varios hilos necesiten acceder a grandes cantidades de información de forma casi simultánea. Estos hilos no sólo estarán repitiendo la información en memoria sino que muchas veces estarán repitiendo todo el proceso de extraer dicha información. Este problema suele estar resuelto en la mayoría de librerías de acceso a datos (base de datos mayormente). Por ejemplo, podemos encontrarnos con el caso de ehcache, que utiliza hilos para almacenar información (Thread-Specific Storage Pattern). De esta forma, el acceso y almacenamiento de esta información es compartido, por lo que se disminuye tanto el uso de la memoria necesaria como el tiempo de procesador requerido para extraer y darle forma a la información. Los diferentes hilos que procesarán esta información, irán pidiéndole los datos a ehcache, que se encargará de optimizar estos accesos. Para mejorar esta solución tenemos las colecciones concurrentes, que permiten a diferentes hilos utilizar los mismos objetos sin presentar problemas de concurrencia. Existen más soluciones para mejorar la alta concurrencia (sin entrar en optimizaciones del propio código), pero las aquí descritas suelen ser buenas ideas con las que comenzar. 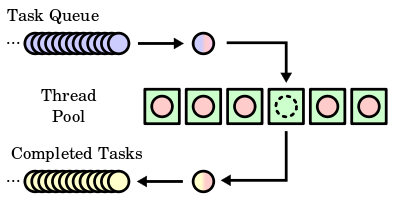 In this case, the first method that we think of is the Thread Pool Pattern . This pattern will limit the number of threads running at the same time. Instead of creating new threads, we create tasks, which are piled. Also, we have a pool of threads that will work picking these up and running as soon as possible. A classic example of this thread can be found on SwingWorker. If we want to implement bare hands our own pattern, we should take a look at the interface ExecutorService. If you have a background thread that is making heavy use of processor, but we do not mind slowing it down for performance, we can use the command sleep ( Thread.sleep (...)) to periodically release the thread processor, allowing other threads to run faster . This is useful for threads running in maintenance mode, which must be kept running but do not have to respond in real time. Another way to temporarily stop a running thread while another is using the method join ( Thread.Join () ), which makes a thread wait until another thread ends. Although more useful if we have a clearly higher priority thread than another, it is not viable if we can not have a reference to a higher priority thread from the lowest priority to tell which thread has to wait. But the high turnout is not given only by the use of the processor. It may be that multiple threads need access to large amounts of information almost simultaneously. These threads will not only be repeating the information in memory but often will be repeating the entire process of extracting that information. This problem is usually solved in the majority of data access libraries (mostly database). For example, we have ehcache , which uses threads to store information ( Thread-Specific Storage Pattern ). This way, access and storage of this information is shared, thus decreasing both the memory usage required and the processor time required to extract and shape information. As the threads wants to process this information, they will be asking ehcache for the data, which will optimize these hits. To improve this solution have the concurrent collections, which allow different threads to use the same objects without any problems of concurrency. There are more solutions to improve the high turnout (without going into optimizations to the code itself), but those described here are usually good ideas to start.